This four-season sleeping bag is designed for the dynamic alpine enthusiast and built to offer more thermal protection for your alpine adventures. LTK Series The ALPINE LTK 900 is filled with warm, co mfortable Down Blend: nature and technology combined in a mix of natural down and synthetic insulation. The synthetic insulation guarantees long-lasting thermal comfort and high breathability, while the natural down offers a good warmth-to-weight ratio with high heat retention. After being compressed, the down regains its loft. The result: a comfortable insulation that will dry faster than all-down insulation, will cope well in damp and wet weather conditions and will be easy to care for. The full-length zipped opening has an anti-cold flap to block air incursion. The mummy fit is close to the body and snug, reducing the amount of air you have to heat up, thus keeping you warm more easily. The shell is in soft polyester with a water-repellent finish. Its ripstop weave is lightweight and resistant to abrasion and tearing. It thus stops down poking through, while remaining packable and easy to carry. The JET PACK SYSTEM� is a compact storage system built into the hood, to simply roll up and fasten the bag. Grappling with your bag to squeeze it into its storage sack is history. It packs as small as a water bottle, No need to compact the bag in another one. It packs as small as a bottle size, so will free up lots of space in your pack. For over 80 years, MILLET has been committed to designing ever more technical and efficient products. This commitment to you also serves to protect our mountain playground. Because we want the mountains to be beautiful, we are limiting the environmental impact of our activities. 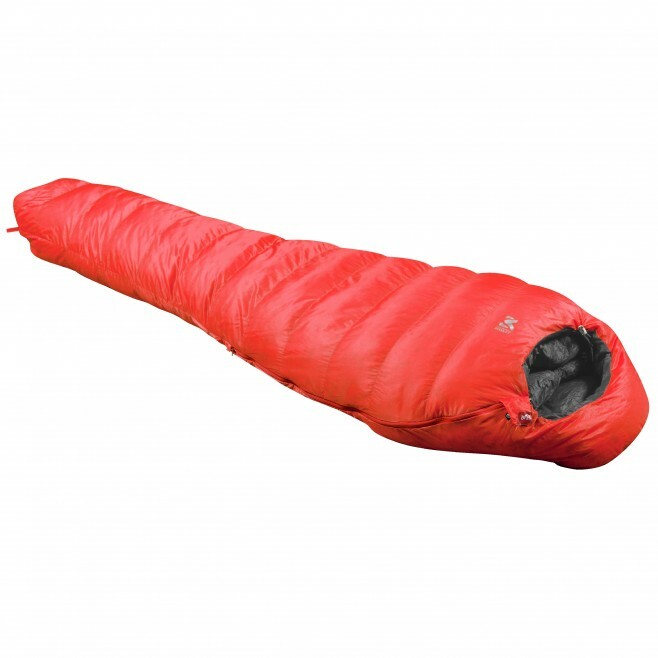 MILLET rates this sleeping bag a Low Impact� product, through the use of Bluesign� components and Responsible Down Standard (RDS) certified duck down, which guarantees the down comes from ethical sources and requires constant monitoring of all production processes (spinning, weaving, dyeing, and finishing) and the materials used in them.